I'm very interested in blindsolving. 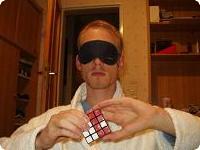 That is, first analyze/memorize a scrambled puzzle sighted, then solve it by twisting while being blindfolded. Also see the blindsolving records page on speedcubing.com. So far I've blindsolved these puzzles (in chronological order): 2x2, Skewb, Pyraminx, Clock, 3x3, Megaminx, 5x5, Super 5x5, Square-1, 4x4. I did Megaminx right after 3x3 because I wanted to do something new. As far as I know, I was the first blindsolver of Megaminx, Super 5x5, Square-1, Skewb and Clock. For Square-1 and Megaminx I'm still the only one. I was also the first who blindsolved a 5x5 officially, i.e. in a WCA competition, though others had done it earlier (and faster) at home. Very similar to my older method but much faster. My method is easy and powerful and has become quite popular. Little description of my Megaminx blindsolve. Little description of my Super 5x5 blindsolve. Real easy since you can turn each single clock on its own with simple 2-4 turns. Because of a recent case of apparent cheating (not in competition, but in a cube club meeting), I thought about better blindfolds.